Our Hospitality Team does an amazing job of making sure first-time guests and regular attendees feel welcomed each weekend. 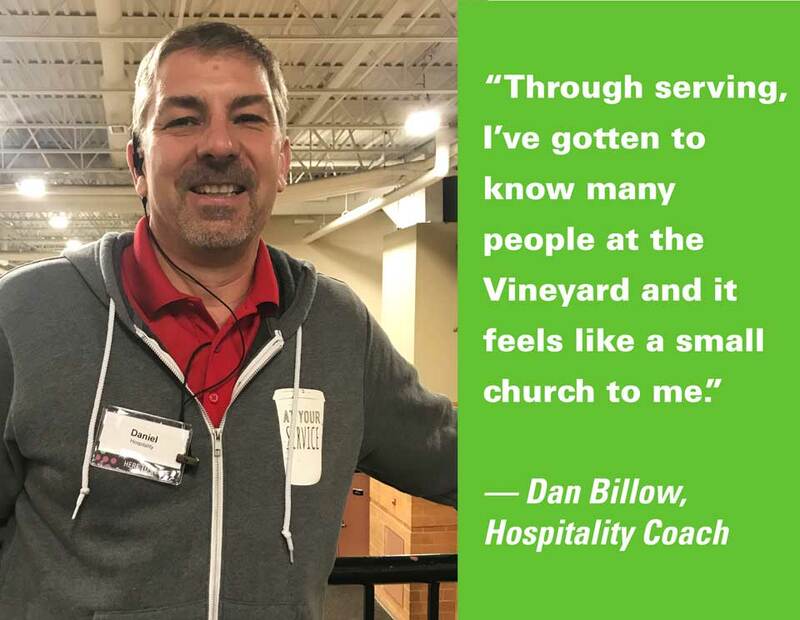 We asked a long-time volunteer and Hospitality Coach, Dan Billow, how he started serving here at the Vineyard. Do you feel connected with the community at the Vineyard? Absolutely, but I didn’t feel connected until my wife Vicki and I started serving. It's a big church and we would sneak into the balcony and then sneak right out. Once we started serving we began to meet and become friends with a large number of people. Also, we would see the same people coming to church every week and got to know them. Then we became Shareholders. Given the time at church through serving, I now know many people at the Vineyard and it feels like a small church to me. How has serving changed you? When I started serving I looked at it as a "task to be done,” and making the coffee was my task. Over time, I came to realize that the task is just a means to an end. It is important to have coffee ready, but more importantly I can be a positive event in someone’s day. I can connect with someone I might not normally connect with. I can serve God's purpose in a little way. Although I am far from perfect, over the past 12 years my focus on serving others in all of my roles (husband, father, stepfather, son, brother, employee) has grown. How did you start serving? Vicki and I always talked about getting more involved. When our two youngest kids graduated from high school, we used that as an impetus to say "no more excuses." The day after their graduation we volunteered in Hospitality. I held doors (I was qualified to do that…) I could hold the door, smile, and say hello. But I really wanted to serve coffee and kept helping with that until a person moved on and I took over. Being an engineer I just had to improve the way the coffee was set up. We served every other week, then we got our son to serve with us and he absolutely loved it. The Monday after serving he asked me "we go back next week to serve don't we?" I lied and said "of course we do." And then sent an email to Jenn asking if it was okay if we came every week. One thing led to another and I became a zone leader, then a co-coach with Vicki for the 10:30B team. We also volunteer for Financial Peace University and wherever else we can. How did you start coming to the Vineyard? Vicki brought me to the Vineyard years ago and the welcoming feel was perfect to combat my cynicism. I especially liked that we could bring coffee into the church. At my first service, I was on the aisle and we were all supposed to be holding hands and I was confused. Was I supposed to hold the hand of the person in front of me or behind me? Dave Workman walked by. He stopped about five rows past me and sensing my confusion held my hand during the prayer. Years later I told Dave that story and he jumped up and told me that he remembered that day. He said that in all the years the he was pastor he only came into church from the back three times and he remembered holding my hand.